tea and lemon shortbread cookies — Mel bakes things. Hello. Hi. Remember me? It's okay, I won't be surprised if you don't. A blogging-hiatus happened. There was a bit of reflecting involved. And some reading. And then, four days ago, the best thing about my blogging hiatus arrived. A brand spankin' new DSLR camera. He's a dapper gent. I call him Alistair. He's deserving of a fancy-pants name like that. Oh, right. The names. Sometimes, I name appliances. Usually the important ones. My red Kitchen-Aid mixer: Sebastian. My Cuisin-Art food processor: Hercules (I mean, come on, he can chop/demolish basically anything you throw at him. You can't have a more perfect name than that.) For the record, I also name random animals at the zoo. I never claimed to be normal, okay? These came from a desire to sit around drinking tea and eating...something. Too much Downton Abbey, perhaps? That's what they do every third or fourth scene (read: at least 3-4 times per episode). Shortbread seemed to be a good choice, mostly because it's a pretty versatile cookie. You can add a lot of different things to shortbread and still have it work out. 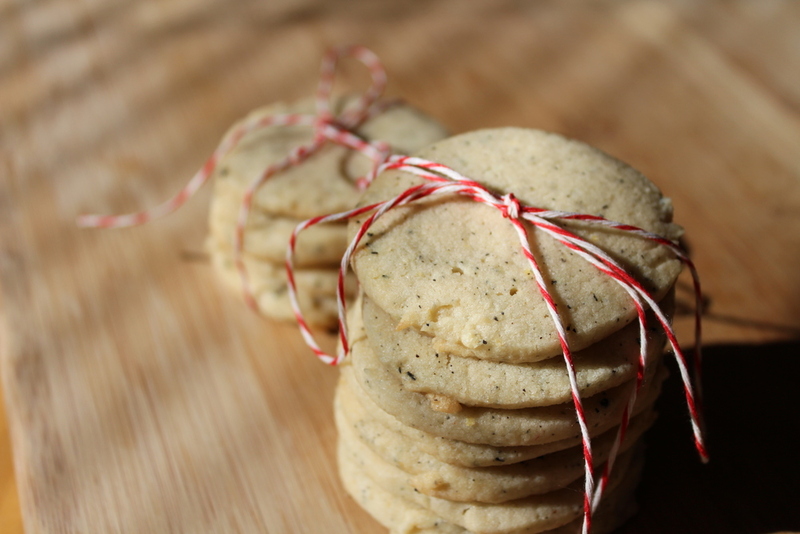 The recipe I used from Take A Megabite (who has probably one of the most gorgeous blogs ever) was originally meant for lemon rosemary shortbread cookies, and essentially, all I did was swap out the rosemary for loose leaf tea leaves, and change up the preparation process. The dough is made using a food processor, mainly because you need to process the tea leaves with the sugar pretty thoroughly to avoid having huge crunchy bits in your cookies. The fewer stems there are among your tea leaves, the less likely you are to end up with little twigs in your cookies. Use a higher-quality tea, if you can. I ended up using some "Mad Hatter's Unbirthday Tea" I got at Disneyland a while back. It's a black tea that's got some peach, ginger, and apricot in it. I had intended to use a Cream of Earl Grey tea (it's my favorite tea ever...you can find it here), but I was running low. I was pleasantly surprised by how well these turned out. I still had a few cookies that had some small twiggy bits (although nothing so crunchy or off-putting that it would keep anyone from eating more than one), and I think next time I will a) use a better quality tea, and b) try steaming the leaves for just a few seconds to soften them up a bit. Otherwise, the tangy flavor of the fruit balances really well with the salt and vanilla...they're great with tea or coffee, and are super-simple to put together. Using a food processor, process tea and sugar together for 2-3 minutes. Tea should be in much smaller pieces, and you should not see many twiggy bits. Add the butter to the processor with the sugar and tea. Process until the mixture is lighter in color, and a bit fluffy looking. You may need to stop the processor and scrape the sides of the bowl once or twice. Add vanilla, lemon juice and zest. Process (pulse 8-10 times) until combined. In a small bowl whisk flour and salt together. Slowly add this to the butter mixture, processing until completely incorporated. Shape the dough into a log, about 2 inches in diameter and wrap in parchment. Chill in the fridge for at least 30 minutes. Preheat the oven to 350°F. Line your cookie sheets with parchment. Slice dough about 1/4" thick, and place on cookie sheet about 1 inch apart. Bake for about 8-10 minutes, rotating half way through. They will be just barely golden around the edges. Watch closely: they can bake quickly at the end. Cool for 10-15 minutes before digging in. Once they've fully cooled, store them in an air-tight container.